Triumphal arches are one of the most recognisable structures that can be associated with the Roman Empire. They were built to span a road but since then have become an architectural symbol and more importantly famous landmarks that attract people from all over the globe. Here are some of the world’s more popular triumphal arches. 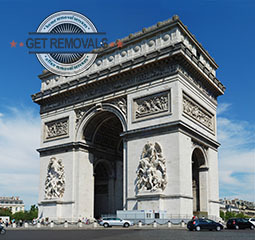 Arc de Triomphe – Located in Paris, this triumphal arch is beyond any doubt the most renowned on Earth. It is situated between the Louvre and the Grande Arche de la Défense on the emblematic Champs-Élysées Boulevard. It was commissioned by Napoleon in 1806 as a commemoration for his victory at Austerlitz. The arch was officially inaugurated in 1836. It is 50 metres tall and until 1938 was the tallest triumphal arch in the world. Today it is one of the city’s symbols and most visited landmarks. Arco di Costantino – Situated between the Colosseum and Palatine Hill, the Arch of Constantine is one of Rome’s most recognisable structures. It was erected during the early 4th century by the Roman Senate to honour Constantine’s victory over Maxentius. It is 21 metres tall, 26 metres wide and 7.5 metres deep and has a central archway (11.5 metres tall) which is flanked by two smaller ones. Arco di Tito – The Arch of Titus is also situated in the Italian capital and dates back to the late 1st century. It was commissioned by Emperor Domitian in the memory of his late brother Titus. It is believe that the arch has been used as a model for the design of the aforementioned Arc de Triomphe in Paris. The arch is made of marble and is approximately 15 metres tall, 13 metres deep and 5 metres wide. Wellington Arch – Also known as the Constitution Arch or the Green Park Arch, this structure lies in the central parts of the English capital in the southern perimeter of the world famous Hyde Park. It was designed by English architect Decimus Burton and was built during the first half of the 19th century. At first it was topped with the Wellington Statue which was later replaced with the Quadriga. In present time, the arch is one of the city’s most popular landmarks and is often described as a must see site. So, make sure that you visit it once your removal to London is over. You can immensely speed up and facilitate your move by using the assistance of professional and licensed removal contractors. Patuxai – Translated from Lao, Patuxai means “Victory Gate” or “Gate of Triumph”. It is located in the capital city of Laos, Vientiane and is one of the country’s most emblematic structures and well-known landmarks. Its construction started during the late 1950s and ended over a decade later in 1968. It is made entirely out of concrete and has a total of seven floors. Patuxai was designed by Tom Le Anh Quan and is slightly taller than its Parisian counterpart.